Pituitary adenomas are benign tumours of the anterior pituitary gland. Small tumours may remain asymptomatic and it is therefore difficult to determine the true incidence. The estimated prevalence is in the region of 15%. Pituitary adenomas are classified as being either a macroadenoma (more than 10mm in size) or a microadenoma (no more than 10mm in size). A microadenoma may not produce any symptoms related to the mass effect of the neoplasm. Further classification can be made on the basis of whether or not the tumour secretes any hormones. Thus there are non-secretory (non-functioning) and secretory pituitary adenomas. A non-functioning microadenoma has the best chance of being asymptomatic. Functioning adenomas are further categorised depending on which hormone or hormones they produce. Tumours which secrete thyrotropin releasing hormone are rare. A minority of tumours make more than one hormone. Historically, pituitary adenomas were classified in terms of whether they were composed of acidophilic, basophilic or chromophobic cells. This categorisation has largely been superseded by classification on the basis of size and function. Microscopically the tumour is composed of nests and sheets of cells that lack atypical features. Immunohistochemistry can confirm the clinical diagnosis of the identity the hormone or hormones synthesised by the tumour. Carcinomas of the adenohypophysis are rare and account for less than 1% of tumours of the anterior pituitary. Like carcinomas of other endocrine organs the distinction between an adenoma and a carcinoma of the pituitary is difficult. In the case of the pituitary the distinction is limited to the presence or absence of metastases. Pituitary carcinomas probably develop from adenomas and may be subclassified in the same fashion as adenomas. The most common hormones that are manufactured are ACTH and prolactin. A craniopharyngioma is an anterior pituitary tumour which is derived from embryological remnants that have remained in the pituitary. It is generally considered to be a benign tumour. The tumour is more common in children but can affect adults of a wide age range. The incidence is around 1 per 1000,000 per year. The tumour has solid and cystic components. 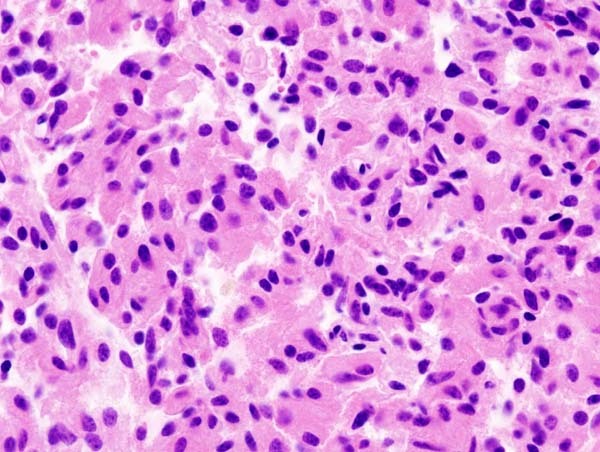 The cells of the tumour are squamoid and can be arranged in either adamantinomatous and/or papillary patterns. In the former pattern the cells are grouped into nests and trabeculae. Peripheral palisading is seen and the cells in the centres of the groups are loose. The cyst fluid of the adamantinomatous type resembles motor oil; that of the papillary pattern does not. Calcification is seen in the adamantinomatous type. The adamantinomatous type tends to be present in childhood craniopharyngiomas; the papillary variant is found in adult tumours. Although considered to be a benign tumour there are rare cases of metastasis or transformation into a squamous cell carcinoma. 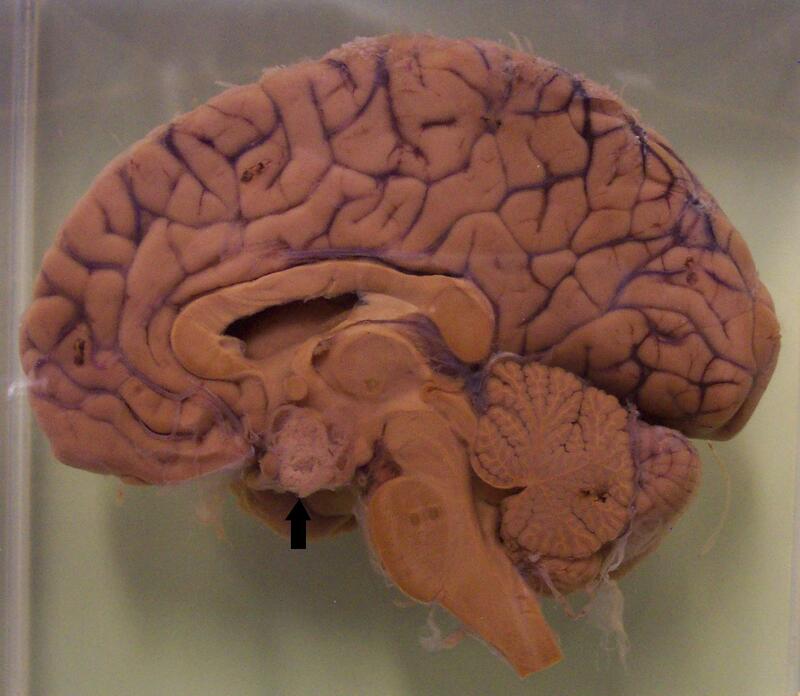 Saggital section of the brain in which a craniopharygioma is present (black arrow). The mass effects of a tumour of the pituitary can produce the characteristic features of a intracranial space-occupying lesion of a raised intracranial pressure: headache, nausea and vomiting and focal neurological deficits. In the case of a pituitary neoplasm the focal deficit takes the form of a visual disturbance; the close proximity of the optic chiasm to the pituitary gland means that the optic chiasm can be compressed and damaged by the tumour. The classical visual disturbance that occurs is a bitemporal hemianopia, although alternative visual field defects can also develop. Compression of the pituitary stalk by the tumour may induce hyperprolactinaemia. The tumour can damage the hypothalamus. This is particularly seen with craniopharyngiomas. If the tumour is a hormonally active adenoma the patient may have the features which are caused by oversecretion of that hormone (such as Cushing's disease or acromegaly). Imaging of the head with CT and/or MRI can demonstrate the tumour. Various tests of pituitary function should be performed in order to determine the hormonal effects of the tumour and to elucidate any damage to other aspects of pituitary hormone secretion. Pituitary tumours can be resected by the transphenoidal approach. Incompletely excised tumours may recur. Pharmacological therapy may be available to control the consequences of excessive secretion of hormones by functionin pituitary adenomas.